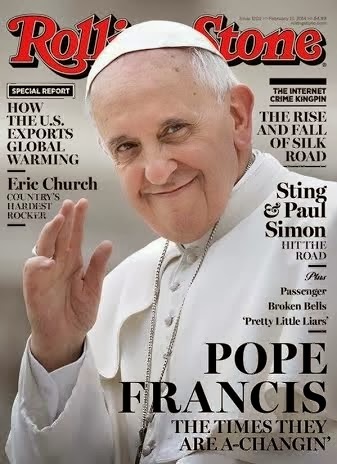 Papal celebrity former Archbishop Buenos Aires, Bergoglio now Pope Francis is on the cover of Rolling Stone Magazine after already appearing on the cover of TIME Magazine. He is said to be the first pontiff to grace the cover of Rolling Stone. He's on the cover of the music magazine's Feb. 13 issue as part of an in-depth profile entitled "The Times They Are A-Changin". His recognizable humanity comes off as positively revolutionary. Against the absurd, impossibly baroque backdrop of the Vatican, a world still run like a medieval court, Francis' election represents what his friend Elisabetta Piqué, an Argentine journalist who has known him for a decade, calls "a scandal of normality." Since his election last March, Francis has consistently confounded expectations with the simplest of gestures: surprising desk clerks at the hotel where he'd been staying during the papal conclave by showing up to pay his own bill; panicking bodyguards by swigging from a cup of maté (the highly caffeinated tealike beverage popular throughout South America) handed to him by a stranger during a visit to Brazil; cracking up cardinals with jokes at his own expense hours after being elected (to those assembled at his first official dinner as pope, he deadpanned, "May God forgive you for what you've done"). After the disastrous papacy of Benedict, a staunch traditionalist who looked like he should be wearing a striped shirt with knife-fingered gloves and menacing teenagers in their nightmares, Francis' basic mastery of skills like smiling in public seemed a small miracle to the average Catholic. But he had far more radical changes in mind. By eschewing the papal palace for a modest two-room apartment, by publicly scolding church leaders for being "obsessed" with divisive social issues like gay marriage, birth control and abortion ("Who am I to judge?" Francis famously replied when asked his views on homosexual priests) and – perhaps most astonishingly of all – by devoting much of his first major written teaching to a scathing critique of unchecked free-market capitalism, the pope revealed his own obsessions to be more in line with the boss' son. The rolling stone cover magazine are widely recognized as most leading rock n' roll bands of all time. It is really great experience to read all the stories of this famous magazine.